WHO: Sistas’ Place and Back to Basics radio broadcast and podcast hosted by Journalist / Activist Nayaba Arinde. 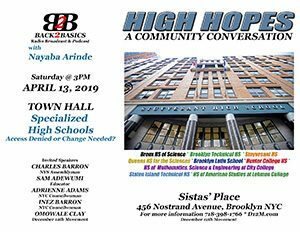 WHAT: HIGH HOPES IN EDUCATION – A Community Conversation on ‘Access To Specialized High Schools’ in NYC. Educators, academics, politicians, and activists will be on the panel and in the audience to discuss these burgeoning issues surrounding public school education. Former Principal /Educator NYC Councilwoman Inez Barron; NYS Assemblyman Charles Barron; Human Rights Activist Omowale Clay.